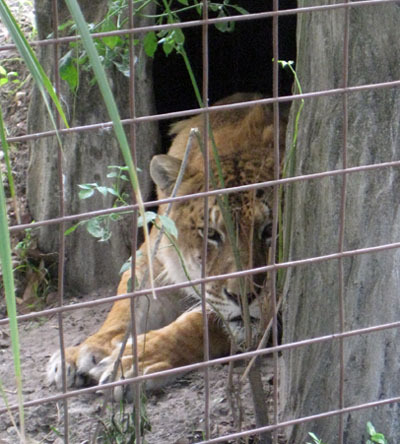 If you’re planning a visit to the Tampa, Fla. area, consider Big Cat Rescue — a fun and educational destination where you can see tigers, lions, leopards, cougars, bobcats, ocelots and more. And it’s rated as the number one attraction in Tampa by TripAdvisor reviewers. I visited last summer and agree with those reviewers! Of course, I haven’t been to every attraction in Tampa, but I’m a cat fan, so . . .
Big Cat Rescue is a large non-profit sanctuary for big cats that were abandoned or neglected, many as pets. Some of the big cats were saved from being slaughtered for fur coats. Other times, the cats are retired from performing. Sadly, many people still think it’s acceptable to own a big cat as a pet. It’s popular among drug dealers, and some states haven’t outlawed the sale or ownership of big cats. Part of Big Cat Rescue’s mission is to help you become aware of how you can support stronger laws against big cat ownership. If you’re visiting Big Cat Rescue, keep in mind that you may not be able to see all the cats during your visit. For example, I wanted to catch a glimpse of the fishing cats, but it wasn’t meant to be. However, Freckles the liger didn’t mind staring my way! There are plenty of cats to see, but don’t expect any circus-type performances. Once a big cat enters the sanctuary, it has found its home until death. The big cats that live there will never be sold or used for breeding. Their sad times are behind them. You can support the work at Big Cat Rescue for free by mailing your used printer cartridges. Get the details at Big Cat Rescue/ink.